Gardaí and customs officers in Cork have seized a consignment of fake Ugg boots, which have an estimated street value of between €1m and €1.5m. The seizure follows a raid on an industrial unit at Hollyhill in the city. 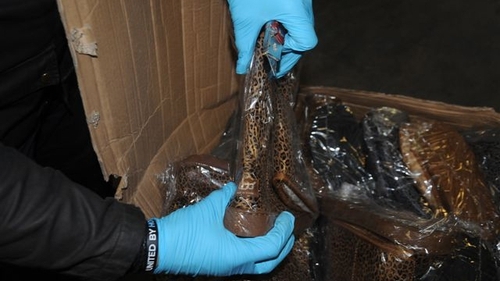 Two men have been arrested on suspicion of breaching the Trade Marks Act. Gardaí and customs officers raided the warehouse at Hollymount Industrial Estate earlier today. Members of Cork City Divisional Fraud Unit were backed up by the city's Garda Regional Support Unit and detectives and uniformed gardaí from Gurranabraher. The counterfeit goods were being removed from the premises this evening. Sources have told RTÉ News that the haul of goods could amount to three or four articulated truck loads. Gardaí are liaising with executives of the company that manufactures Ugg boots as part of the investigation. The two men arrested are being held at Gurranabraher Garda Station and can be held for up to 24 hours. Gardaí say the operation is continuing.